What would you do if you ran a public health nonprofit organization and just received a $2 million grant to address critical malnutrition issues in Sub-Saharan Africa? 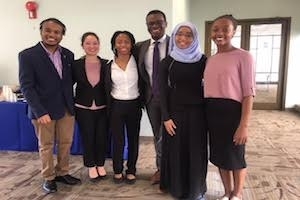 This was the question confronting six competing teams of AU students in AU’s 2018 Intramural Public Health Case Competition, sponsored by the Department of Health Studies and the College of Arts and Sciences. Each team was given the “case” details two weeks before the competition. They had to research the issues, develop strategies, and prepare an action plan. The teams then presented their plans to four judges: Alexander Justice Moore, Chief Development Officer of DC Central Kitchen; Leslie Koo, Senior Nutrition Advisor in the US Agency for International Development’s Bureau for Global Health; Emma Sacks, PhD, Evaluation and Research Lead at the Elizabeth Glaser Pediatric AIDS Foundation and adjuct faculty member of AU’s Department of Health Studies; and, Lynda Honberg, Captain, US Public Health Service (ret.). Promote operational research and periodic surveys into food and nutrition issues. The innovative approach would utilize community partnership, outreach, community workshops, and agricultural education. The team based its strategies in social ecological model and recommended partnering with existing health clinics already working with the target population in Freetown, Sierra Leone.